Thursday: Relive the glory that is "Planet of the Apes." Plus: What did you think of "Top Chef" on Wednesday? 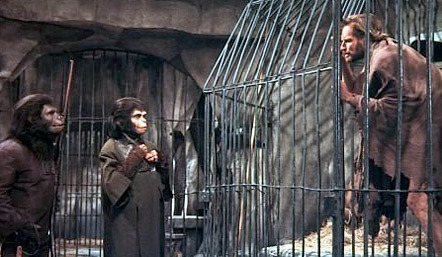 How many years has it been since you watched Pierre Boulle's 1968 classic film "Planet of the Apes"? Can you quote at least three lines by Charlton Heston? Can you picture that last scene on the beach in your mind? If not, it's time to watch this lowdown dirty ape of a movie once again tonight (8 p.m. EDT on AMC). Oh, what a night! On "Live From Lincoln Center," Gabriel Byrne plays King Arthur in the musical "Camelot" (8 p.m. EDT on PBS, check listings), while the 2007 Sundance documentary "Hear and Now" (8 p.m. on HBO) explores the decision of a deaf couple to get cochlear implants at the age of 65. The last regular episode of "Survivor: Micronesia -- Fans vs. Favorites" before Sunday's finale airs tonight (8 p.m. on CBS); then another deliciously soapy new episode of "Grey's Anatomy" airs (9 p.m. on ABC), followed by another deliciously dark episode of "Lost" (10 p.m. on ABC). And that's not to mention the deliciously funny finale of "30 Rock" (9:30 p.m. on NBC). What did you think of the "Top Chef" on Wednesday? Go here to discuss. Patrick Stewart, Clay Aiken, Robert Downey Jr.